This is the cover to Secret Wars #1. The first time around, back in the eighties. By Mike Zeck, it’s all very familiar, it’s a classic. Note the appearances of Fantastic Four’s Human Torch and The Thing, as well as X-Men’s Wolverine, Cyclops, Rogue, Nightcrawler, Colossus and Storm. 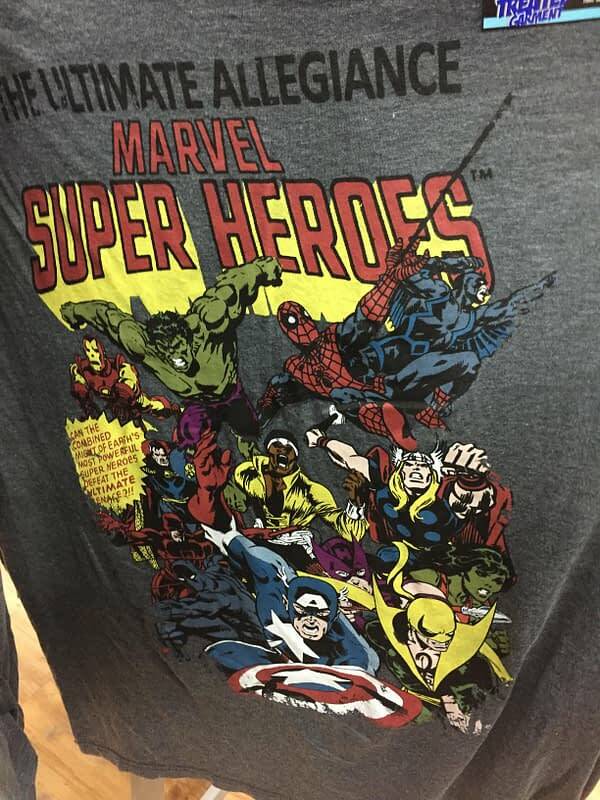 Well here is the Secret Wars cover, on a T-shirt on sale at Wal-Mart. Note the removal of all Fantastic Four characters, and X-Men characters, replaced by Iron Fist, Power Man, Black Panther, Daredevil, Black Bolt and Doctor Strange – and the removal of Captain Marvel as well. Basically taking away the non-Marvel Studios characters and a Captain Marvel who might get confused with the new Captain Marvel, and introducing characters to be seen in upcoming movies and TV shows, even if they look radically different, and won’t actually be seen on screen for years yet. On the CBR forums, there is a thread called the CompleX which details what they see as slights made against the X-Men by the publisher, in favour of Marvel Studios characters. Well, guys and gals, consider this Exhibit A….